Holding hands in a circle – arms raised. Point with L foot in front, sweep L foot around behind and step on it, step with R foot, L foot goes over in front. Pivot on L foot, turn in opposite direction, step with R foot, bring L foot together with R. Step again with R foot. Bring L foot up as if to skip almost, but then place back down. 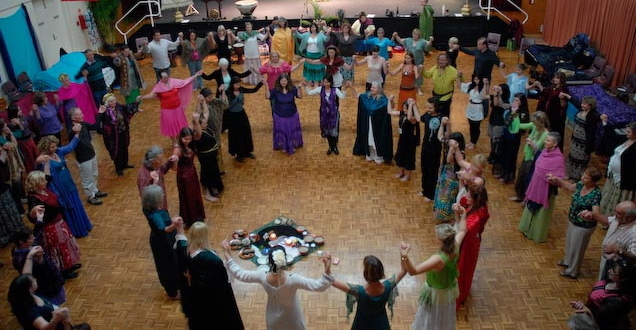 Step with R foot and turning to centre, L foot over in front, R foot around from behind and bring L together with R.
NOTE: The Imbolc/Early Spring Meditation (in which there is reference to this dance) on PaGaian Cosmology Meditations CDs may also be purchased by itself in digital format.